A lethal combination for making your music sound great! This bundle combines the know-how of some of the world’s most renowned producers and mix engineers in one convenient package. Between them, they have several Grammy Awards and engineered, mixed or produced groundbreaking works like Metallica’s "Black Album" (Randy Staub), Chris Isaak’s “Wicked Game” (Mark Needham), Dire Strait’s “Brothers in Arms” (Neil Dorfsman) and Steve Earl’s “Guitar Town” (Chuck Ainlay). Combine that with mastering settings by a senior engineer at the leading mastering studio in Scandinavia as well as a great addition to the core EZmix 2 content and you have a lethal combination for making your music sound great! 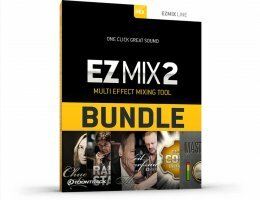 The Chuck Ainlay EZmix Pack comes with a large variety of effect chain presets suited for a broad use in any context of mixing. Or as Chuck puts it: "I decided to craft something that everybody needs, like a great vocal reverb with delay, a way of making a bass drum really punch through a track or a mix bus preset to get optimum gain on your mix". Even if you don’t know the name of the man responsible for mixing these artists’ albums, you certainly can’t deny his work and the fact that his recipe for making successful albums seems to work. Meet Mark Needham; producer, mix engineer and all around nice guy with over 35 years in the business. Mark has taken time out of his busy work schedule to hand craft a very useful and exciting collection of effect chain presets. Vocals, guitars, bass, keys and drums – there’s a little something for everyone in this pack. A must have for everyone looking to beef up their “in the box” mixing options! Do like the stars: fuel your songs with some signature, multi-platinum Mark Needham magic! Your mixes will thank you.